The recent market correction which happened in the beginning of October 2018, is a warning sign. The correction, although not very large, brought some panic into the markets and showed how harsh the end of the bull run will be. Those who do not take the correction as a sign to move their investments into industries resistant to the bear market, could face financial uncertainty in the near future. It’s hard to exactly predict the industries which will see growth in the coming bear market. The predictions are difficult to make not only because they concern the future of economies, but also because consumer spending habits have changed after the 2008 crash (1,2). Still, there is enough data to make rational predictions about the industries which will be hurt the most and the least by the coming dip. Lower consumption trends during recessions are the main reason why the value of consumer good companies, and by proxy, industry decreases. Uncertainty about the near future and hesitation related to one’s financial situation leads to lower consumption of consumer goods. And these trends are exacerbated by the media. Recessions are a boon for them. Fear-mongering is a great way to get higher ratings. If consumers are constantly hearing negative news related to the economy, sooner or later they will be affected by them. Combined uncertainty about the future and negative statements about the economic future create a destructive force. Consumer good industry is, with almost 100% certainty, going to fall in value when the next bust comes. Increasing saving during recessions is also a reason why the consumer good industry loses value. Foregoing purchases, and instead putting money into savings, is a choice many consumers will make. Without a doubt, increasing savings is good for the person who is making that choice. However, if that choice will be made by the majority of consumers, the financial sheets of companies in the industry aren’t going to look good. And that’s bad news for the investors. 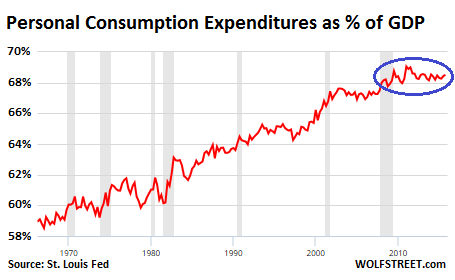 Seen in the graph above, the 2008 crash and its aftershocks slowed down the growth of personal consumption expenditures. The same will likely happen during the oncoming crash. Lower incomes and higher unemployment from lower consumption will also play a role in consumer good industry companies losing value. This cycle is simple: people choose to consume fewer goods and services because of uncertainty for the future. Because of lower consumption, the revenues of businesses drop. People have to be laid off. Consumers become even more uncertain, and consume even less. Thus, the cycle continues until there is a change in some of its causes. This type of cycle hits the revenues of consumer good industry the most. Increased cooking at home during economic downturns is the main reason why the restaurant industry could fall in value during the next one. People choose to cook at home rather than to go out because of their changing priorities. If saving money and foregoing expenses is a top priority, then eating at restaurants, a non-necessity, won’t happen as frequently. Moreover, economic downturns come with increasing inflation. And inflation means rising costs of food supplies, which, by proxy, means higher prices of restaurant meals. Higher prices cause fewer customers visiting restaurants, further hurting their revenues. Meal prepping is an extreme example which gained popularity after the latest bust. Previously only seen in low-income persons, meal prepping and eating home-cooked meals at work became very common for the middle class. This means that if meal prepping will become even more common, it will certainly reduce the revenues of the restaurant industry. However, since meal prepping is still very common, restaurants have survived even with this negative influence on their revenues. This factor could potentially play only a small role in the restaurant industry falling in value. Lower disposable incomes because of rising inflation and potentially lower salaries, most likely will be the main reason why the restaurant industry will fall in value. The only outliers which potentially will suffer a lower impact will likely be fast food restaurants (quick service restaurants) oriented towards low-income customers. The revenue of fast food restaurants declined only marginally from 2008 to 2009 and showed a large rise in 2010. Since dining out will become less affordable (due decreases in income and rising inflation), customers may develop a preference for cheaper options, them being fast food chains. Consumer electronics are liabilities for their owners. Consumer electronics tend to lose their value very quickly, and often require repairs and additional accessories. After fast growth from 2005, the economic downturn made a large impact on the consumer electronics industry. Because consumer electronics are non-necessity goods, it’s expected that the revenues of consumer electronics companies will decline during economic downturns. That’s when consumers have to make hard choices about their priorities. And non-necessity goods with fast declining value won’t be in the top position of consumer shopping lists. Another factor why the consumer electronics industry could fall in value during the coming dip is the number of people who already own smartphones, smart TVs and entertainment devices. While they were a novelty in mid-2000s, now not owning a smart device is rare. Consumer electronics devices, even if they require repairs, can function around 5 to 15 years without major problems. Therefore, during times of economic uncertainty, consumers neither will be incentivized by the novelty of most consumer electronics products, nor they will buy them to replace malfunctioning devices. 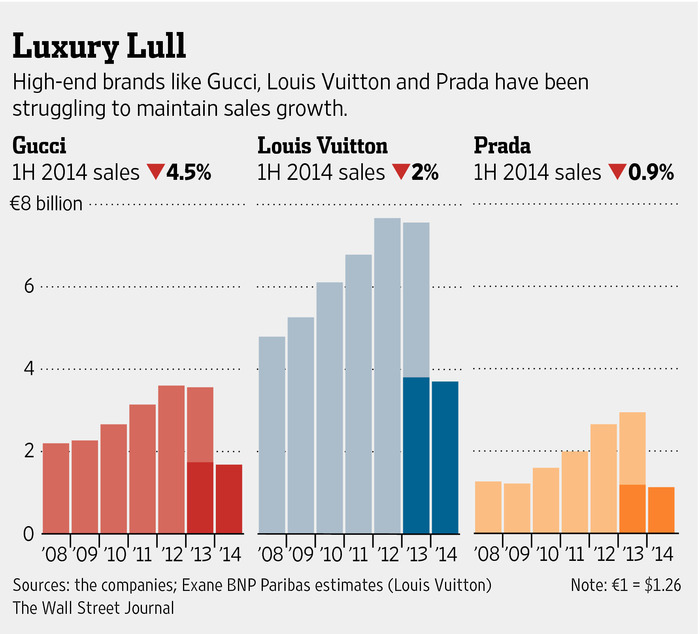 Luxury product companies have been named as bear-market resistant (1,2). Since the consumers of luxury products are mostly people with above-average incomes, even during economic downturns, they can afford to maintain their consumption patterns. The luxury clothing industry fared better than fast fashion clothing companies in years 2008-2014, seen in the charts below. Luxury car makers also boasted rising sales numbers in 2010-2016. Another reason for the luxury industry gaining in value in the coming dip is their exclusivity. Customers not only value the quality of luxury products, but also their exclusivity. One way the exclusive quality of luxury products is maintained is through their prices. Even if the prices of luxury products will stay the same during the next dip, the decreasing incomes and investment returns will make them less affordable. Fewer people having the means to afford them will make them an even more restricted purchase. Since luxury companies maintain their value through the limited availability of their products to the consumers, the coming dip could mean increased sales for them and for the whole industry. There are always exceptions to rules, and the luxury industry could be the way to safeguard assets during the next bust. Investing in the banking industry during a financial downturn seems counter-intuitive. However, after considering the very small amount of regulations which were imposed on it after 2008, and how the practice of “repackaging” of sub-prime mortgages continues to this day, the banking industry could gain in value during the next financial crisis. It’s interesting to observe how the US banking industry, which essentially caused the sub-prime mortgage crisis, fared better than European banks in the financial crisis years. The above chart shows a decline in revenue for US banks in the second and third quarters of 2008. 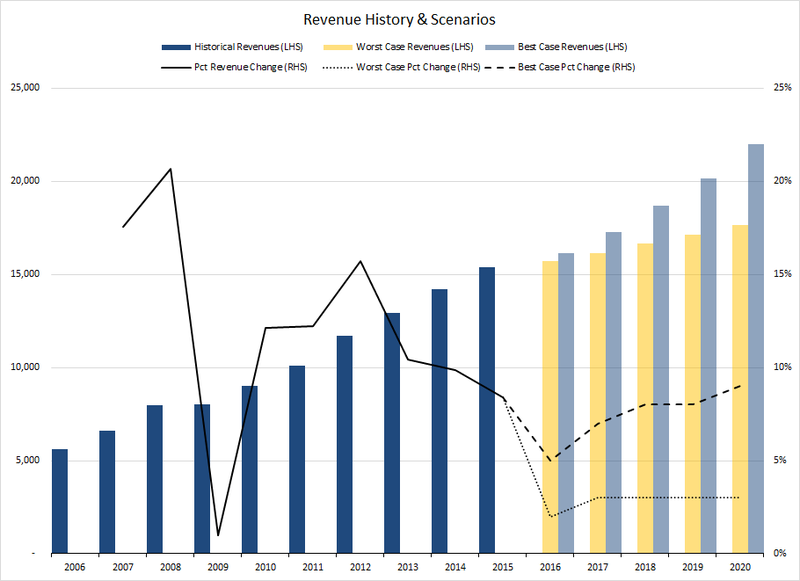 However, the first quarter of 2009 revenue is better than revenues from first quarters of 2007 and 2008. Of course, a factor in the rise in revenue during the first quarter of 2009 could be bank bailouts. Without them, banks would have suffered major losses and with them, lost customers and revenue. Nevertheless, who can say with 100% certainty that during the next downturn, banks won’t be bailed out again? They are essential to the whole economic environment, and politicians likely won’t risk a total collapse and will bail out the banks again. Although the industry of low-cost staples formally doesn’t exist, the great performance of companies supplying low cost staples during the financial crisis deserves a mention. 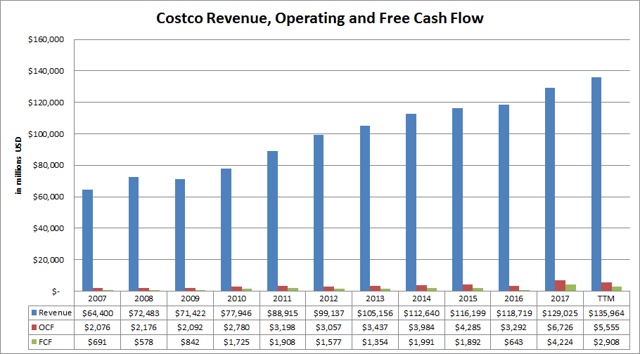 There is a clear distinction between how low cost staple companies, such as Costco, and other retails giants fared during the bust. The boom of rising revenues of low costs product companies can be attributed to consumers wanting to save more, lower incomes and higher unemployment leading to lower disposable incomes. Speculating about the future in an already uncertain present is very hard. Nonetheless, investors can always learn from the vast data available to them and the past performance of industries. Analysts, advisors, brokers and bloggers are just means to get the information an investor seeks. During the coming bust, there will be many contradicting opinions, but the final decision where to invest money should be done without paying much attention to them. Only the individual investor knows what type of investment they feel the most comfortable and secure with. Disclaimer: the author of this article does not own and does not plan to acquire or sell stocks of companies in the industries mentioned in this article. This article is not intended to be taken as investment advice. Only the investor is responsible for the risks they take, and the losses they could acquire. ‹ Robinhood investing + How does Robinhood make money?